A peanut butter and jelly sandwich is probably the most well-known, most loved and the easiest sandwich to make. What could be better than that? I'll tell you what...a FRIED peanut butter and jelly sandwich! Oh, my gosh. I did not know what I had been missing all these years. Now that I have made one (and devoured it), I will never eat a PB & J any other way. It truly is mind-blowing. I know you may be thinking, "how different can it be?" Oh, wow. It is SO much better. I guarantee you that you will taste your first bite and your eyes will go wide and your taste buds will ignite. The crisp and crunchy bread is delightful but the real winner of the sandwich is the hot, MELTED, gooey peanut butter. Words cannot explain well enough how much better it is but please, for your own sake, TRY IT! Get out your peanut butter and favorite jelly and your bread. Spread peanut butter out over one piece of bread and jelly over the other. Put your sandwich together and set aside. Add your butter to a hot skillet and allow the butter to melt over medium heat. Don't burn your butter. Place your sandwich into your pan and allow it to fry until the bottom is golden brown. Gently turn over the sandwich and allow to get to golden brown also. Remove and place it on a plate. 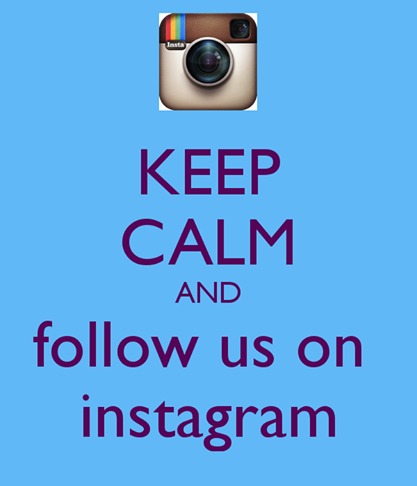 Are you connected with Countrified Hicks on Social Media? Community is super important to me. I live on a farm, out in the country. The nearest town has less than 2,000 people in it. 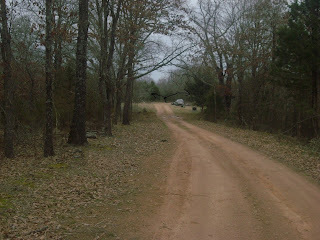 This is the little "lane" that is at the beginning of our property and leads up to our home. I only have 1 friend in town. All my other friends are online and 99% of them, I have never met in real life but I love them all dearly. Because I am isolated and enjoy the friendships that I have, I want everyone to know the various ways I communicate with "my people". I have several social media accounts so I hope you will "pop" by each one and follow me on them and be sure to say "hi" while you are there. You can find me on my Facebook page "Countrified Hicks 2". That is the place you will find me on a daily basis and have the largest batch of community. We are very social and the people on my FB page are all one big family. I am also on Twitter and just celebrated my 7 year anniversary with Twitter. I don't post as often as I should be love reading and sharing other peoples "tweets". 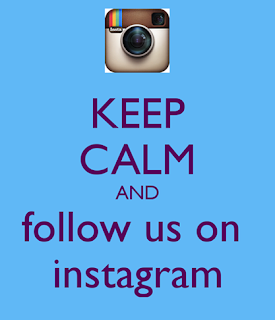 On Instagram is the place that I share the majority of our farm life pictures. I also share pictures of our day-to-day lives. Lots of family pictures, animals and garden updates. I love Pinterest. I have a LOT of boards and love the community style boards where a lot of people can all add pins. If you have a community or shared board, please send me an invite so I can start pinning there too. I pin pictures of all my recipes and anything I find visual and interesting. I am super excited about my Youtube account. My family and I create videos of all kinds. I try to do video how-to's on recipes, DIY stuff, animal antics, etc. Be sure to follow me on Youtube and subscribe to my channel so you never miss a single video. I hope you will be sure to connect to me on my social media. I look forward to connecting to each and every one of you! This is my 2nd year to be a part of the Northwest Cherry Growers Canbassador program. This year I am using the cherries in two different ways. First, I will be dehydrating the cherries to make a delicious snack. In case you have never tasted a Ranier cherry, they are not too sweet and not too tart. They are just perfect. They seriously are the most delicious cherry we have EVER tasted. We enjoy them as a snack; dehydrated to use in granola or trail mix; we use them in baking and in cereal. There is actually no wrong way to eat them. 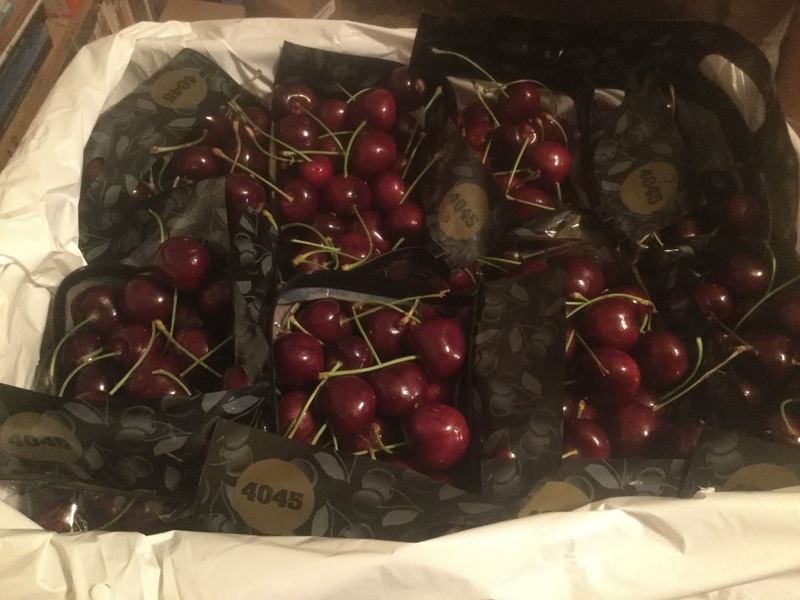 Please check out the Northwest Cherry Growers page. They have lots of good ideas and recipes and even printable labels. 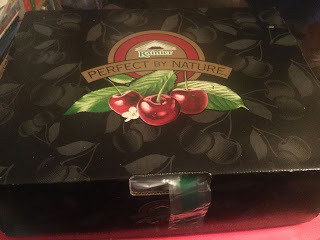 And if you want to see what I made with Ranier cherries last year be sure to find the recipe Canning Cherry Amaretto Jam. 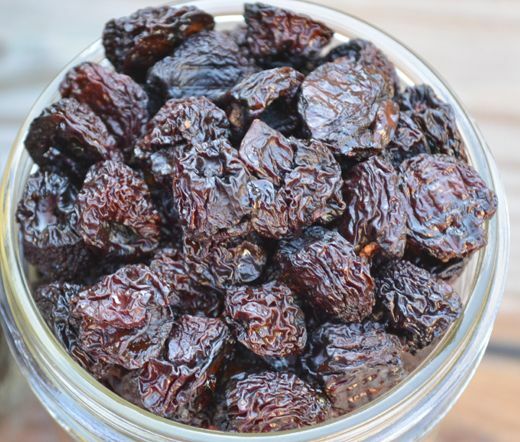 Dehydrated cherries are juicier than most dried fruit. They are soft and chewy. They have a great taste and texture. To dehydrate cherries, you first need to wash them under cool running water. Once they have been washed and dried, you need to use a cherry pitter and pit each cherry. Since we will be using the dehydrated cherries through out the year for all different kinds of recipes (muffins, cakes, etc.) and will also use them as snacks, I decided to cut some of the cherries in half for this batch. Once the cherries have all been halved, just spread them out on your dehydrator trays. Turn on your dehydrator to 135 degrees and let them dehydrate overnight and check them the next morning or just let them dehydrate for 12-14 hours. When done, they should be sticky and pliable. Some people like them to look like raisins and let them dry longer but I like them before they reach that state. I don't want them to be all dried up. Dehydrated cherries are juicier than most dried fruit. They are soft and chewy. They have a great taste and texture. Dehydrated cherries can store in any airtight container. I generally store mine in canning jars. If you don't plan on using them for awhile I would add in an O2 absorber. 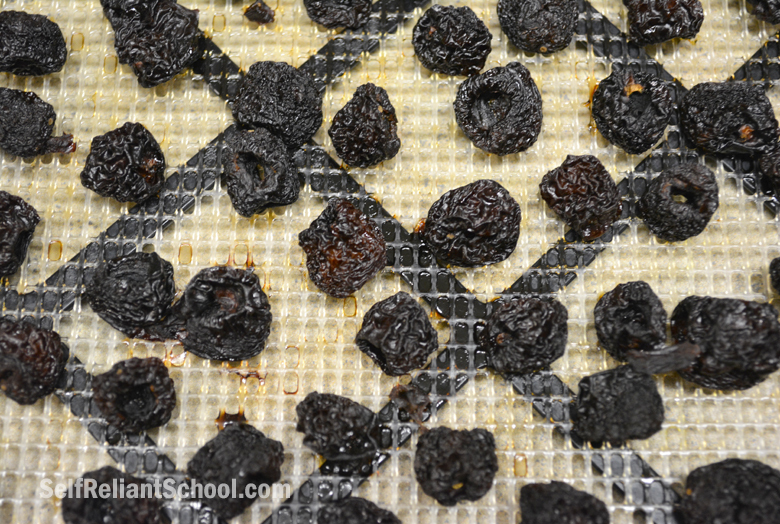 Other ways we use dehydrated cherries is to use them in any recipe that calls for raisins or craisins. They also go great on ice cream and stirred into yogurt! Yum!